At this website, you'll meet Professor Hack Harddrive in videos (many free videos, plus Pay Per View videos) and books. His just-released E-book is video enhanced. Not since the parodies of Weird Al, or songs like "They're Coming to Take Me Away" or "The Monster Mash" has there been this much mashed madness in songs and verse. 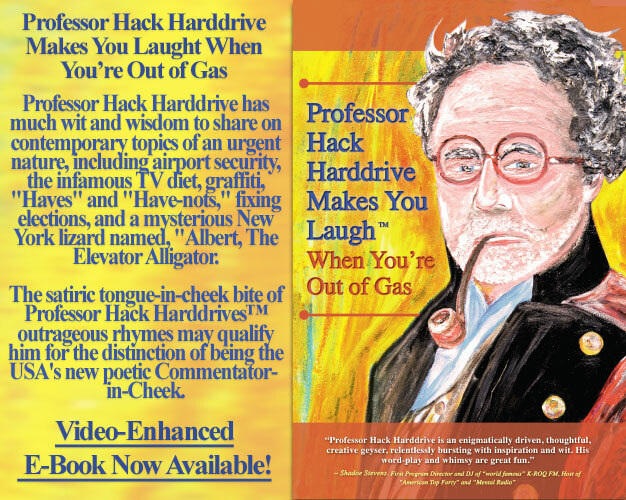 New videos are added almost weekly, because Professor Hack Harddrive has arrived to mess with your mind and hack your funnybone. click on photo to buy books. “Rappers and rhymers move over. These are poems that anyone can pick up and enjoy – and will not want to put down. The clever images, embedded in catchy rhythms, will stay with you. Like the magician he is, he creates characters, situations and themes, and he fills each poem with memorable wit and word play. This writing is an amazing ‘sleight-of-hand’ and all that can ultimately be said is: Wow! “Professor Hack Harddrive continues to burst forth in multiple media – film, art, literature, music – with all levels of imaginative undulations such as these poems. "THE LIFE AFTER DEATH PROJECT"